Richmond's Department of Procurement Services is now accepting proposals for the development of some 60 acres of land known as the Boulevard Property -- which essentially surrounds the Diamond between I-95 to the north, the rail tracks to the south, Hermitage Avenue to the east and the Boulevard to the west. The request for proposals is the next phase in a process that began in October with the selection of The Staubach Company (Yes, that Staubach.) as the lead consultant for the development of the large tract of city-owned or controlled land. The 22-page Request for Qualifications (RFQ) provides a great deal of clarity around what the future of the Boulevard Property. "Primarily, the city views the Boulevard Property as a major gateway to the City, with extremely high visibility from Interstate 95. Accordingly, the development plans for the site must be generally viewed as beneficial to the positive image of the City as a whole. The City also sees the development as an opportunity to maximize the utilization of the site by moving it away from City ownership to a private sector development that will generate new tax revenue for the City. Ideally, the site will become a vibrant destination location where city, county and regional inhabitants and visitors would come to experience a broad array of lifestyle amenities." The Diamond: "The City currently anticipates that the existing Diamond stadium will be demolished as part of any new development of the site. The City, in concert with the counties of Henrico, Hanover and Chesterfield, supports the future location of the Braves to be at or adjacent to the Boulevard property. 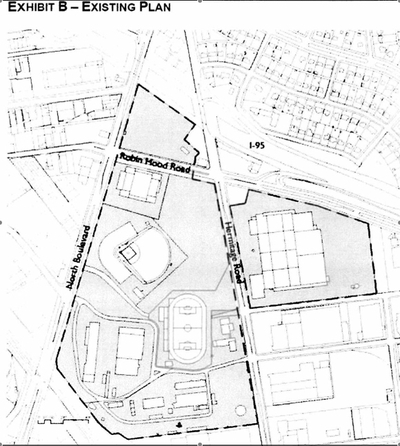 One current scenario being considered by the City is to have the majority of the new stadium and its associated infrastructure (including structured parking) occupy the current Travelland Park site to the north across Robin Hood Road." The Arthur Ashe Center: "The Arthur Ashe Center is a public facility that houses indoor practice facilities for basketball and track. The center occupies approximately 4 acres in a corner of the site... This property, and the land beneath the existing improvements, should be considered as available for redevelopment in any new development plan put forth... The facility will not be required to be replaced, but the City remains interested in honoring Mr. Ashe in some fashion." VCU Sports Backers Stadium: "The Sports Backers Stadium serves as the home facility for VCU's men's and women's soccer team and track and field teams ... [and] additionally serves as the home track for Virginia Union University's men's and women's teams... VCU controls the land under the Sports Backers complex (approximately 5 acres) through "use agreement" that essentially grants title to VCU... Future development scenarios for the site ... should assume that the Sports Backers facility remains in its current location." The Department of Public Works Facility: "The DPW Operations Center and Facilities Depot occupies the entire southern tier of the site... It is the intention of the City that these two contiguous DPW operations be relocated to a new location within the City at some point in the future." The Commonwealth of Virginia's ABC Warehousing Facility: "The Commonwealth's ABC warehousing facility is located directly across Hermitage Road to the east from the site... While the ABC facility has not been slated for relocation, and the Commonwealth has not yet determined the facility's long term future strategy, interested development teams are encouraged to consider as appropriate the inclusion of the ABC property in their development strategies." One of the more intriguing aspects of the RFQ documents can be found in a simple map on page 15 of the packet -- which not only shows the 60+ acres in question but shows them along with the proposed Boulevard Square theater and retail development (along the southern border of the proposed development area) and an additional 60+ acres of property owned by the state and private owners. Together, the triangle of land from West Broad Street north to I-95, and from Boulevard east to Hermitage, represents some 150+ acres of cohesive property. The RFQ makes no mention of the additional properties, other than the map, but the possibilities for Richmond are significant. And the long-term advantages of moving this much land out of the non-taxpaying hands of the city and state, and turning it into not only a tax-base -- but a commercial, residential and/or retail hub -- are hard to understate. Another interesting concept -- an idea, not a proposal -- includes the relocation of the Sports Backers Stadium to the ABC warehouse property, along with the long-discussed aquatic center and tennis center. Moving these recreational spaces to anchor the eastern boundary of the site not only opens the Boulevard corridor to more attractive commercial or retail space, but creates a natural opportunity to recognize and honor the legacy of Arthur Ashe.